Looking for the best hamburger joint in Uptown? Consider these choices. 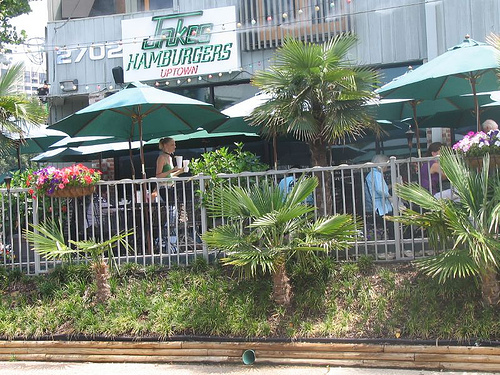 If you’re looking for a local restaurant and want something with staying power that’s been a top hamburger place for years and years, visit Jakes. Jakes on McKinney is a local DFW chain that was established in 1985 and has been going strong ever since. It has about seven locations in the DFW area. D Magazine picked Jakes as the best burger of Uptown, where it edged out the Village Burger Bar. It also made the top 50 hamburgers in Texas, by Texas Monthly magazine. 2702 McKinney Ave, vaguely across the street from Chipotle. Don’t care if your burger is a chain, as long as it’s good? Consider the Smashburger on corner of McKinney and Pearl, near Pei Wei. Sure, it’s a national chain. But the burgers are high quality, and the service is good. It’s not high on ambiance or local flavor, but the parking is good (there’s underground parking on the back side of the building near the Federal Reserve, and it’s always half empty)! 2222 McKinney Ave.
Like your burger super fancy? How about organic ingredients, options like Ahi tuna, lamb and turkey or a toasted brioche bun? Ketchup Burger Bar aims straight for the high end of the burger market, and they succeed. They are located at 3028 North Hall Street. Located in the West Village shopping center, the Village Burger Bar is another completely local option that will not disappoint. Like the Ketchup Burger bar, you’ll find plenty of fancy options in addition to your standard hamburger like truffle fries, portabello mushroom burgers and even beef / turkey burgers. 3699 McKinney Ave.
What’s your pick for the best burger in Uptown? Leave a comment with your vote.